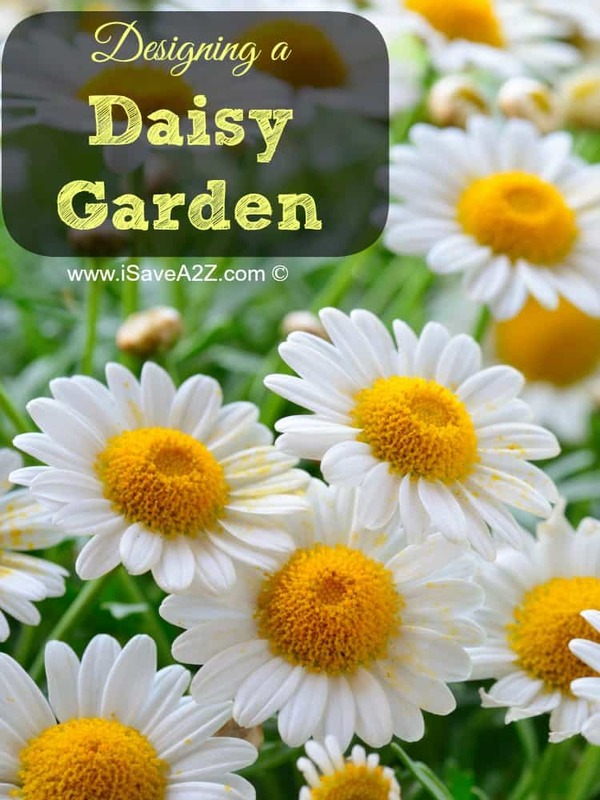 A daisy garden is probably the cheeriest, most colorful garden you can plant and it will continue growing and blooming for the entire growing season. When everyone thinks of daisies, the typical white and yellow comes to mind, but there are actually several other colors and color combinations to daisies. Designing a daisy garden is all about using different varieties of daisy flowers to create patterns, contrast and beds of color. And, in case you missed it, check out our Raised Garden Bed post here. It’s been quite popular with almost everyone! Designing a daisy garden is a great way to add a lot of color and contrast to a garden bed, or to fill an entire garden bed with their bright blooms. With all the choices available to you, you can have a garden that is part perennial and additionally able to be changed around from year to year with different varieties. Use these tips and daisy recommendations to design a daisy garden that gets noticed. Once you begin growing your daisy garden you will notice how easy it is to actually grow daisies. They do not require a lot, if any, care and can be left to grow without pruning, deadheading or trimming back. As long as the ground they are planted in is loose and well worked, daisy plants are able to thrive with little oversight and regular watering. Plants do not need protection or spraying from pesticides either, because they don’t have any natural pests, so they are a great choice for cut gardens that you want to bring indoors without worrying about chemicals. Most daisy varieties are able to grow in zones 3 to 8, so there are several options that will work whatever your location is. Determine where you want the daisies to be used in your garden, if you will be planting in groupings or in rows and then pick plants according to their normal growth. If you like the idea of being able to keep a daisy garden growing year to year, make sure to include a selection of perennials that you won’t have to rebuy and plant the following summer. Annual daisy plants are a great way to change the look and colors present in your garden from year to year, and fill in the space between perennials with small or large varieties. The Shasta Daisy is a hybrid that has become very popular over the last few years because of its ability to grow where other blooming flowers cannot. They are a budget option too because they end up reseeding themselves at the end of the growing season, helping you fill in empty garden space. Shasta Daisies resemble a traditional daisy, white petals with a yellow center, grow in a short bushy manner with stems reaching about 2 feet but as high as 3 feet. Painted daisies are a traditional colored daisy that range from a pure white to a deep red with a yellow center. They are a perennial plant so they will return in the spring, making them another budget friendly choice. Painted daisies prefer partial sun areas, taking longer to really fill out when they are planted in full sun, and they do require regular watering wherever they are planted. Blue Marguerite is a variety of daisy that most people do not immediately think of as a daisy when they first see it. Because of its tiny flowers and thin stems, it has a very wispy feeling to it and makes a great middle bed filler. Golden Marguerite is very similar to its blue variety counterpart, only it is entirely yellow, or gold. This is a great option when you have a very large garden that you need to fill, fill fast and want to see flowers blooming in all summer long. From the first sign of spring till fall this daisy variety is a constant source of color. Plants will fill in low to the ground so you can use them to create a deep border, or fill in the middle of the garden and allow them to fill in between and among other varieties. By Jennifer on March 22, 2014 Gardening.